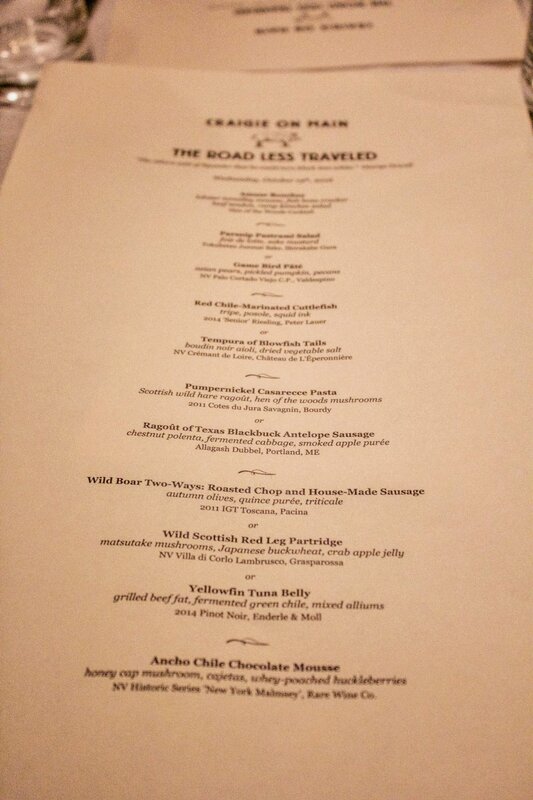 A couple weeks ago I was invited to experience The Road Less Traveled dinner event at Craigie On Main. 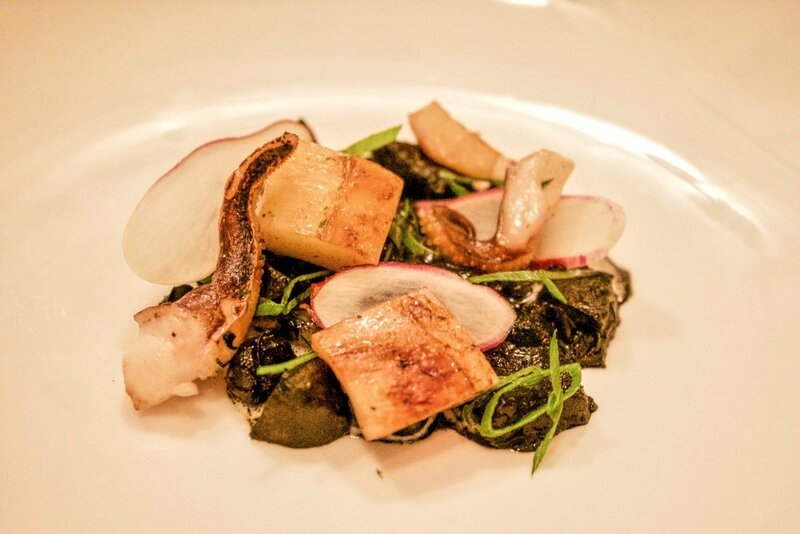 Craigie On Main is a well known French-inspired restaurant in Cambridge, MA, and chef-owner Tony Maws has won numerous awards in Boston for his beautiful cuisine. As you can imagine, I jumped at the chance to try his inventive menu. 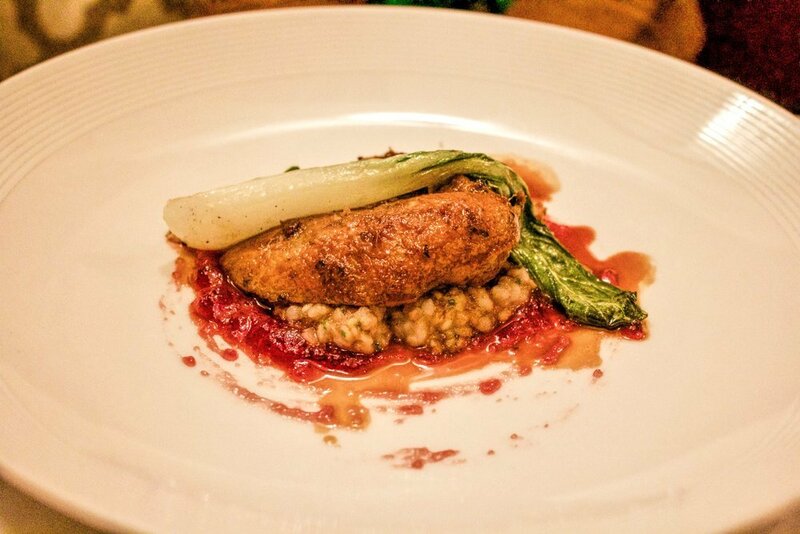 The dinner was five-courses of off-the-beaten-path ingredients. During some courses, I wasn’t sure what I was putting in my mouth, but with each bite, I was intrigued and excited for the adventure that Chef Maws had prepared. 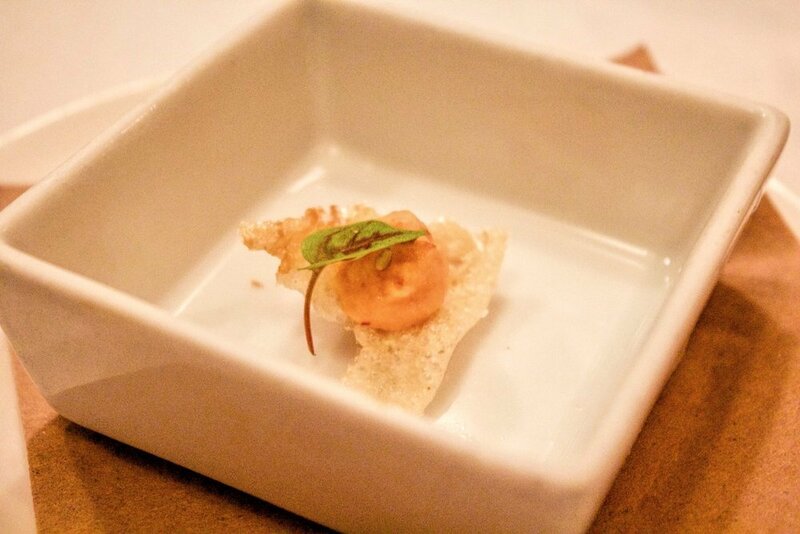 The two bites were lobster tomalley mousse with a fish bone cracker, and beef tendon with ramp kimchee salad. Both bites were small but mighty. The flavors were impressive considering the size, and the ingredients were fresh and complemented one another. 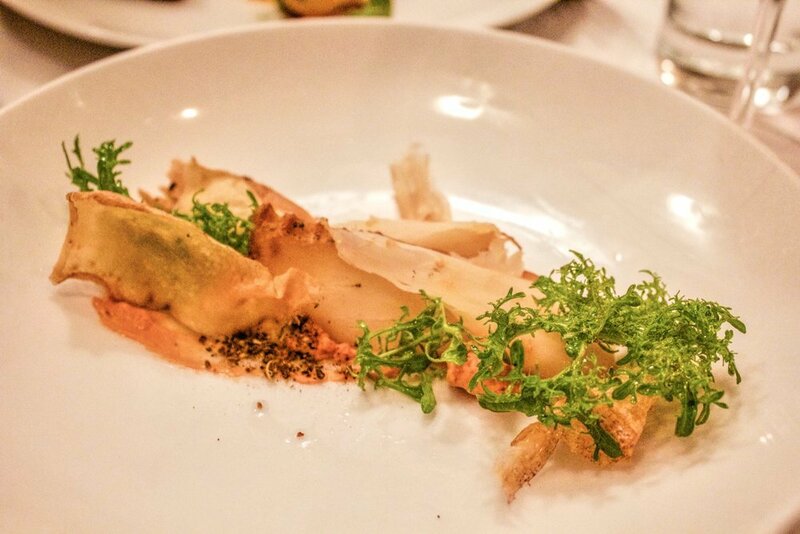 First up was Parsnip Pastrami Salad with foie de lotte and sake mustard. Outside of Thanksgiving, I don’t usually eat parsnip, but this surprised me. It was delicious, and I enjoyed the soft flavors. 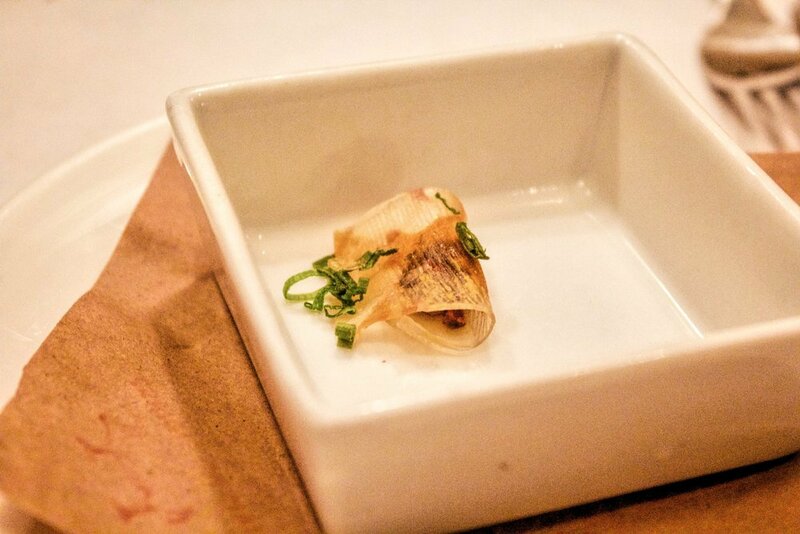 I don’t want to give it all away too early, but the first course was the most adventurous for me. Red Chile-Marinated Cuttlefish with tripe, posole, and squid ink, and Tempura of Blowfish tails with boudin noir and dried vegetable salt. What? Right, exactly my thoughts! Totally an exploration of the unknown for me. 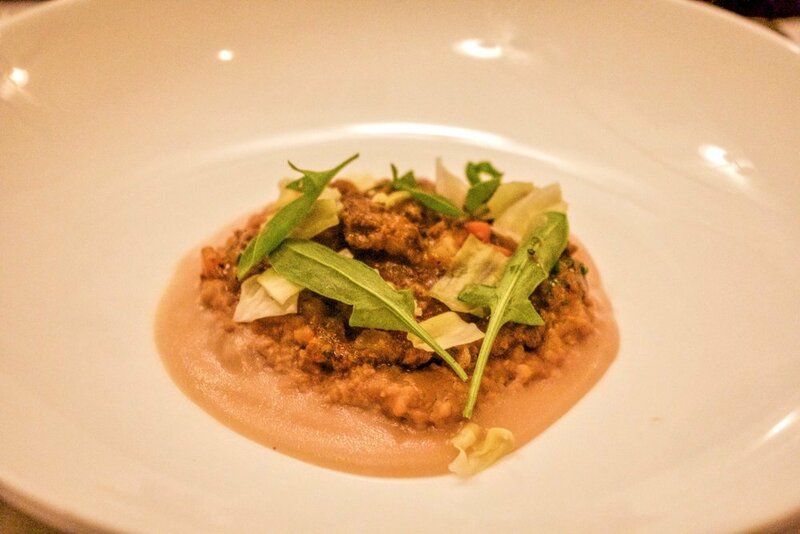 The pasta course included Pumpernickel Casarecce Pasta with Scottish wild hare ragoût and hen of the woods mushrooms, and Ragoût of Texas Blackbuck Antelope Sausage with chestnut polenta, fermented cabbage and smoke apple puree. 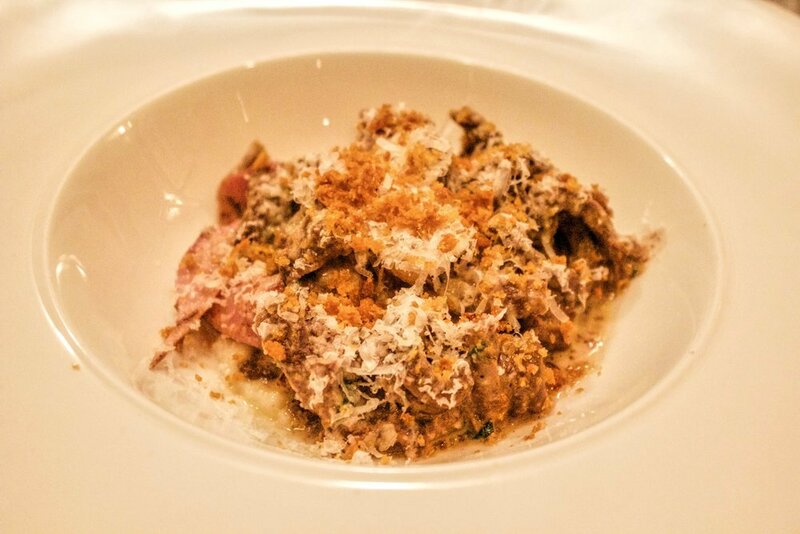 Both of these dishes were composed of fall ingredients – wild hare, chestnuts, mushrooms, cabbage and apple – all of which were totally up my alley. The texture of the pasta was awesome. It had a nice flavor and that classic pasta al dente bite. The ragout was extremely tasty. 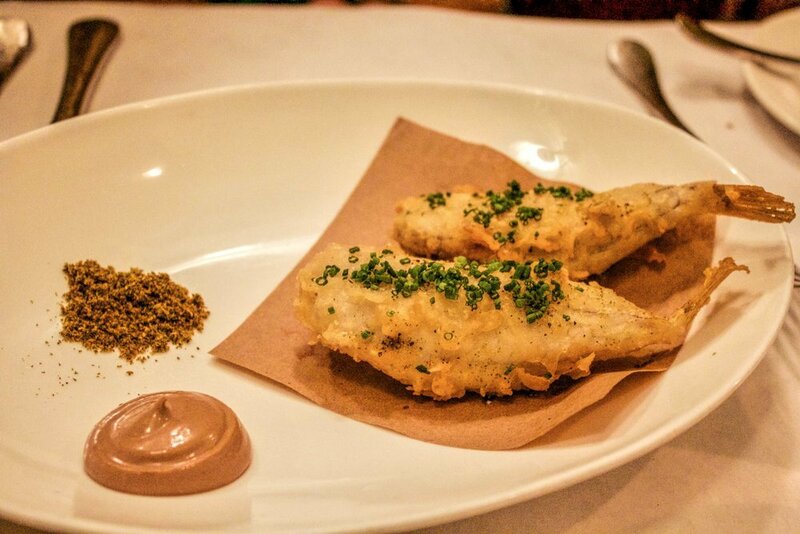 I don’t believe I’ve had wild hare before, and I gobbled up as much as I could… knowing that I still had another course afterward. 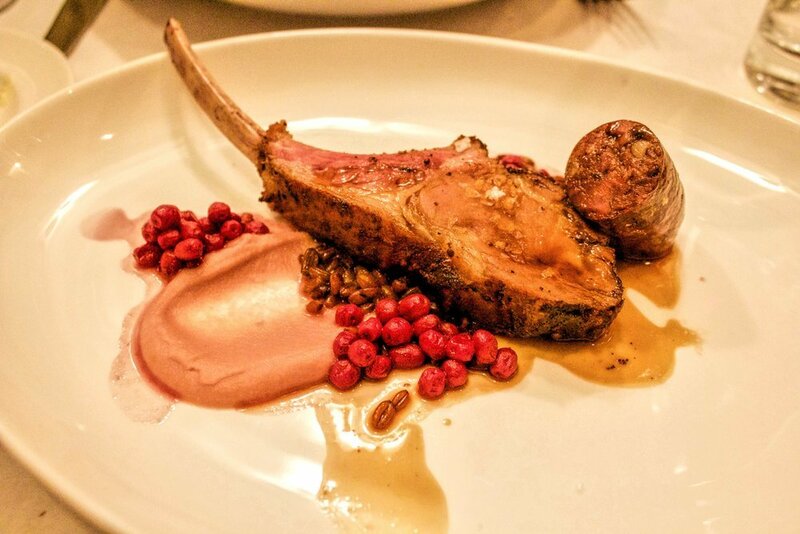 The meat course was comprised of Wild Boar Two-Ways: Roasted Chop and House-Made Sausage with autumn olives, quince puree, and triticale, and Wild Scottish Red Leg Partridge with matsutake mushrooms, Japanese buckwheat, and crab apple jelly. This course was my favorite. The meat was amazing. The wild boar was cooked perfectly, and I love how it was prepared two ways. The accouterments were also spectacular. I had never tried boar before and I was surprised at how tender it was. I can’t really compare it to steak, pork or chicken – I would almost say it’s a combination of the three. 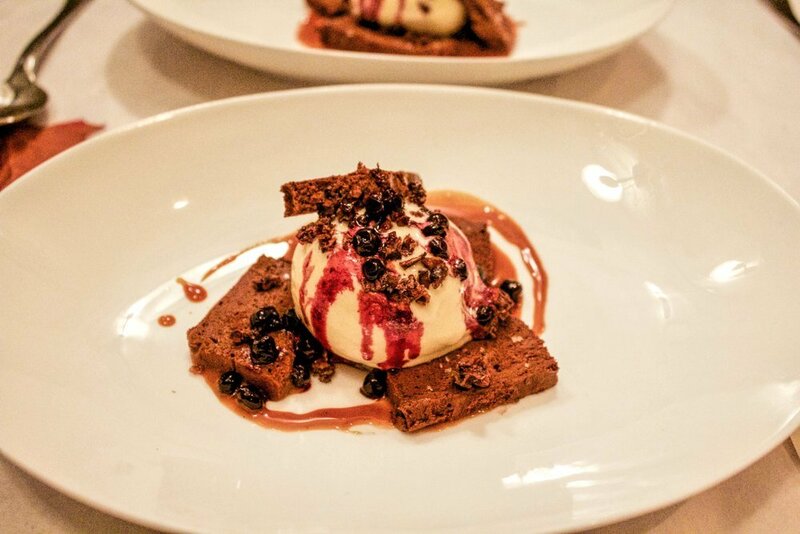 Aka Ancho Chile Chocolate Mousse with honey cap mushroom, cajetas, whey-poached huckleberries. This was delicious with a sneaky spicy finish. It was phenomenal. I love a nice heat, and it was perfectly chocolaty. The huckleberries complemented the spice and richness. Sidebar, who doesn’t love to say huckleberry. While not everything was a complete departure for me, I have to admit this was a total adventure. The unique ingredients and the perfect preparation really exceeded my expectations. I totally recommend keeping an eye out for future dining events from Chef Maws at either Craigie On Main, or this other venture, Kirkland Tap and Trotter. And if you’re not from the Greater Boston area, I urge to try different ingredients when you’re dining out. I promise taking the road less traveled will surprise and delight you! Thank you to Craigie On Main for hosting me! All opinions and images are my own.